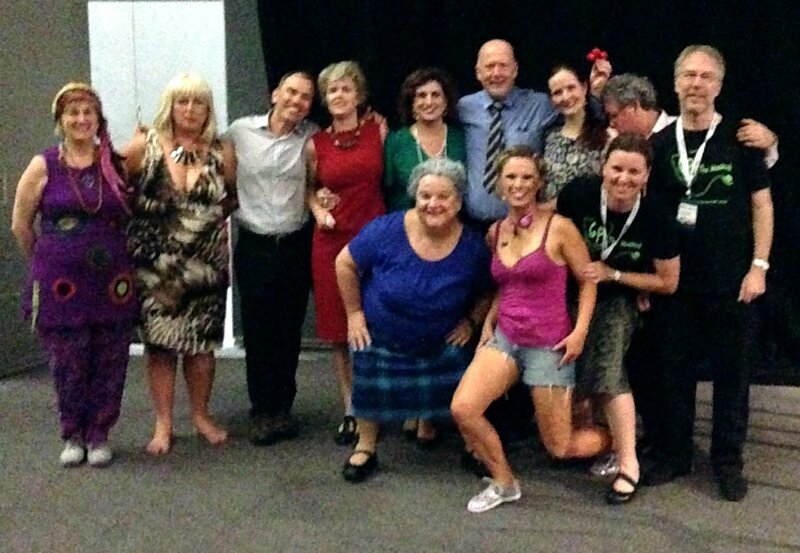 The 8th performance of GP the Musical – the show written, directed and acted by GPs – was up in Darwin this month, as part of the GP13 conference. Still buzzing from our unexpectedly sold out season at the Melbourne International Comedy Festival in April, the cast members were all eager to don their costumes and dance up a storm, despite the Darwin heat. While high on enthusiasm, we were a little rustier than anticipated and had only a very limited time to rehearse. No doubt this was quite stressful for director Dr Katrina Anderson, but she soon whipped us into some semblance of shape using her indomitable directing skills. It is both daunting and comforting to perform in front of colleagues. We expected a very supportive and forgiving crowd (and they were!) but knowing there were some serious heavyweights in the crowd (the likes of RACGP president, Dr Liz Marles, Chair of Council, Dr Eleanor Chew and the legendary Professor John Murtagh) did produce a few butterflies. We weren’t sure whether these VIPs would appreciate us sending up everything from E-health records to naturopathy to heartsink patients, but our college memberships were not rescinded the next day, so they must have taken the show in the tongue-in-cheek manner intended. 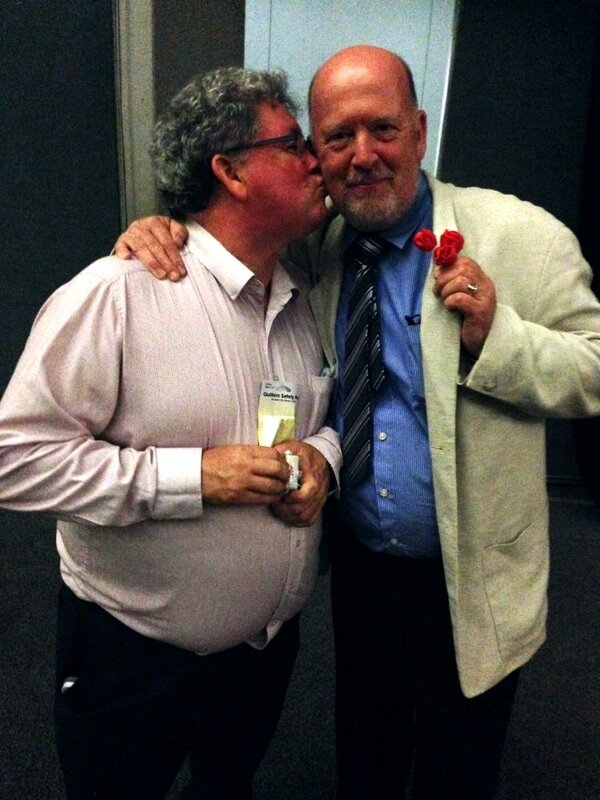 Professor John Murtagh was particularly effusive with his praise of the show. He told us how he had tried to get tickets when GP the Musical was at the Comedy Festival, but was turned away by the box office due to the show being sold out. I’m sure he was too humble and polite to do the whole “Do you have any idea who I am?” routine, but we kind of wish he had! WONCA president Professor Michael Kidd gave us a personal apology for not being able to attend the Darwin performance (he was flying out to India that evening). He had seen the show in Melbourne but said he had wanted to see it “one more time”. Enough of the name dropping! We had many non-India-bound audience members who had chosen to “come back again” for a second or third viewing. 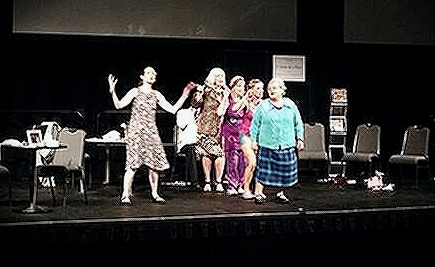 Those who had last seen it at the 2012 GPET Convention, experienced not only a more practised performance but 20 minutes of extra dialogue and two new songs (E-health records and Naturopath Song). There were some changes since the Melbourne International Comedy Festival season too. There were dialogue tweaks (deliberate ones, mostly ;-)) and a cast re-shuffling: a previous patient became the female doctor and the doctor accepted a job promotion to become the receptionist. Dr John Buckley returned as the unstoppable Mr Goodall. The other change was that the show jumped on the social media bandwagon and had a live twitter stream: #GPTM. Photos and comments were posted during the show by both audience members and the show’s multi-tasking receptionist character (while on stage). OK, I’ll stop hiding behind the 3rd person. The crazy receptionist was me. I’d obviously overlooked the fact that playing a new role for the first time with very little rehearsal would probably need my full attention. At some point, I must have subconsciously decided that acting, singing, dancing and playing live music in front of a large audience of colleagues, invited guests and VIPs was not enough of a challenge, and so added live tweeting into the mix. Miraculously I managed to post numerous tweets using the prop conveniently placed on the desk at which I was sitting for much of the show (aka laptop) without missing cues or lines. More good luck than good management, in retrospect. You can check out the tweets at #GPTM if you’re curious. All in all, it was a tremendously enjoyable night (for the cast at least). 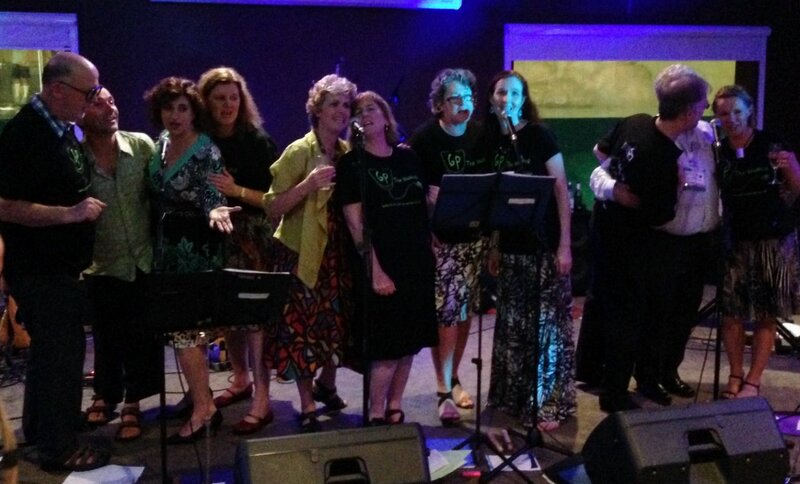 Wanting a little more of the Darwin limelight, we came back “one more time” and did an encore performance of our final song, The one to see is your GP, the following evening at the RACGP Rural Faculty Function. 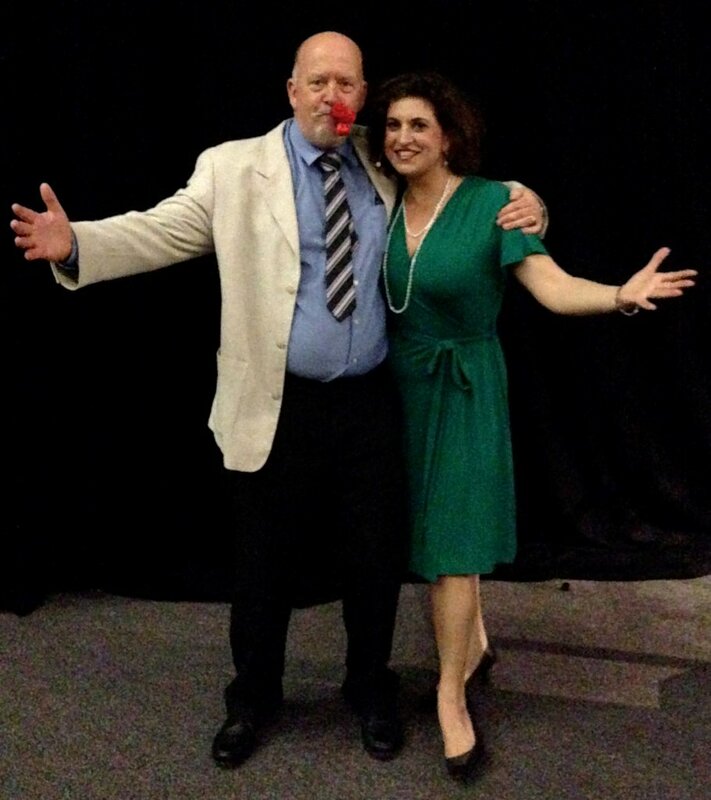 It wasn’t scheduled and we weren’t invited as such – we snuck onto stage while the star act of the evening, the very talented and entertaining GP band, the Medical Cheekydocs, took a five minute loo break. We have the band to thank not only for a wonderful night’s music and for graciously allowing us to monopolise the stage for a few minutes, but for the existence of the musical at all. 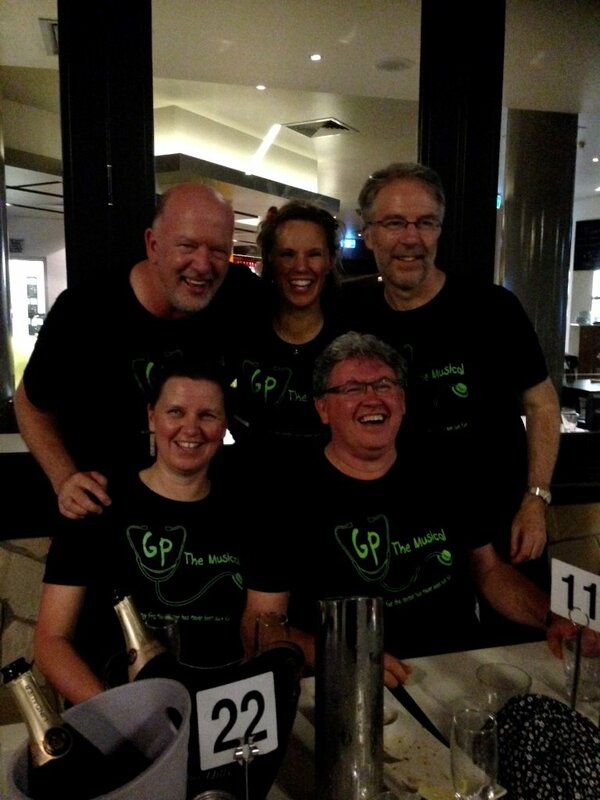 For it was back in 2010, while the band (then called Simon and the GPETtes) were rehearsing on a station outside Alice Springs for the 2010 GPET Convention, that the idea of GP the Musical was first dreamed up by Gerard Ingham and myself (both then band members). We started writing the show a couple of months later, and the rest, as they say, is history. We couldn’t have done any of it without our director and fabulous cast, so thank you all! There are no future GP the Musical shows scheduled at present, but who knows? We may just “come back again” next year to a theatre near you.